Backlit by the riot fires, the snog seen around the world. No, I wasn’t in Vancouver, turning over cars and setting things on fire. I watched Game 7 in relative safety from the luxurious theatre in my small town. When I woke up the next morning, a lot more had happened than a hockey game. There were riots in the streets of Vancouver, and all the bad behaviour that goes along with that. There was news coverage, commentary and public outrage–all the things one would expect to see when idiocy reigns for a few hours. But there was one big difference, this time. 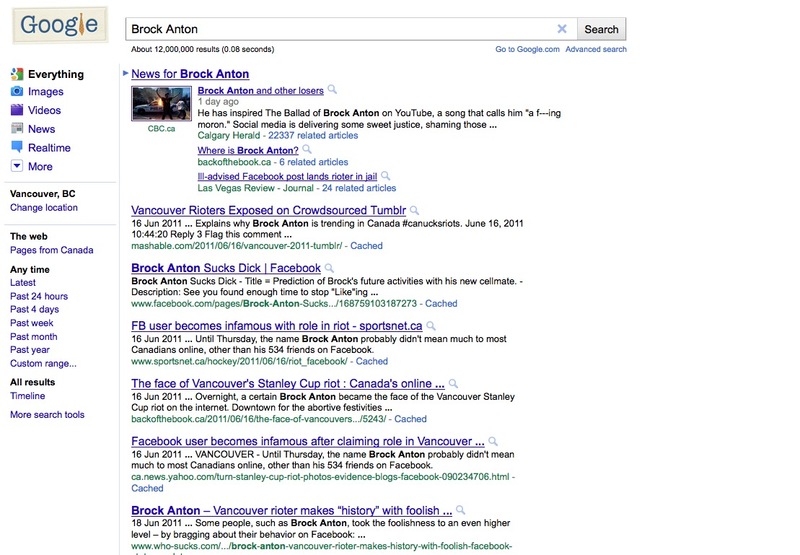 I don’t know if it’s particularly a west coast thing, a Canadian thing, or if it was just that people have had enough of Beevis and Butthead VS Jackass running unchecked in the streets and on the Internet. 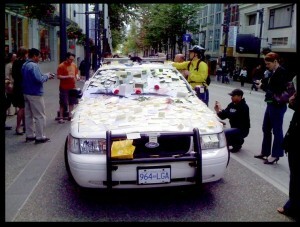 That Thursday in June, the face of Vancouver was marred, but the face of social networking had changed for ever. Or, perhaps I should say: For Good. 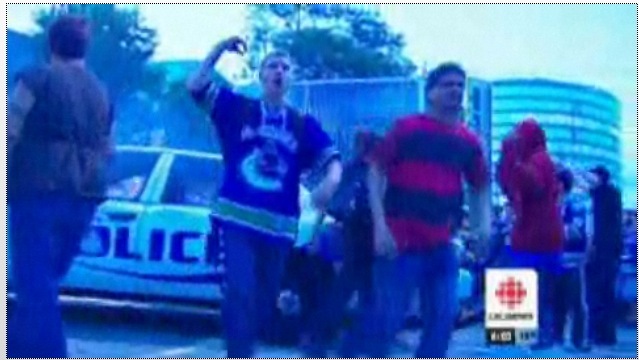 This was not the first time Vancouver had seen riots. 1994 was our first experience with car fires, breaking windows and riots squads firing tear gas into the crowds. That time, a number of people were brought to justice when mainstream media posted a few carefully selected clips from downtown closed circuit cameras. People caught in the act of looting and pillaging were outed by the police and network tv working in concert. A number of arrests were made, the streets cleaned up, and eventually we all sort of got over it. There was a lot of theorizing that the ’94 riots had little to do with hockey, and a lot more to do with thugs and hooligans using the game as an excuse to be anonymous amongst the crowds and just create anarchy for the hell of it. 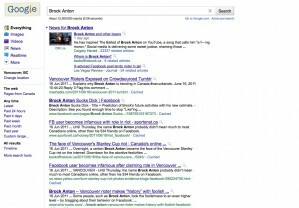 The first few pages of a simple Google search are filled with references to Brock Anton, Poster Child for the Vancouver 2011 riots. As expected, there is backlash. This blog post appeared the next day, Friday: Vancouver’s Human Flesh Search Engine. It’s a well-rendered piece, and being a personal blog, it is an opinion (just like the post you are reading). I don’t agree with most of what the author, ‘Christopher’, had to say, but I sure liked the way he said it. It really made me think about what he refers to as the “mob mentality” of people outing the rioters. Hmmmm…. suddenly, someone is calling into question the ethics of people reporting immoral behaviour. In the end, I have to go with the Shine a Light into Darkness theory of human evolution. I have to believe that good will rout bad, eventually. And so does that suggest I am the judge of what’s good and what’s bad? I guess that is the part we are uncomfortable with. I got scolded recently for the way I “outed” some bullying behaviour at school. I find it kind of ironic that we tell our kids to speak up, to take a stand, we have candle-light vigils and Wear Pink days, and yet there is a line of….judgmentalness? that we are nervous about crossing. Empower the bullied, but don’t shame the bully. I don’t know…..
One of the positives that I see from these past few days of Facebook and Twitter Vigilantism is the humanizing of the face of the rioters. We can’t make assumptions now, like we did in 1994. We see their faces, we see them wearing Canuck jerseys, recognize their youthful exuberance, see that they aren’t all skin-heads, or strangers, or street people. 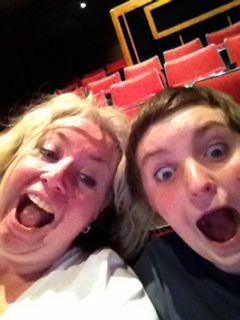 We learned of one mom who recognized her son and marched him down to the local detachment to confess . Another boy whose own dreams of glory might be dashed. Boy is yelling "Yeah, it's going to burn!" Dad maintains there is no proof his son set the police car on fire. No one can make assumptions about who the rioters probably were, because we know who they are. And isn’t it ironic how we used to fear the Internet as a place for child predators and stalkers to hide, enjoying the power of anonymity, and now we fear the power of social networking to out criminal behaviours and misanthropy. Various Thank you Messages to the VDP. Well deserved, and well executed. A month late, I know but I just had to comment — very thoughtfully written piece. Should have been published as the editorial centrepiece in the paper. Thanks for reading. It was an iconic event, for sure.